Dog breath? Cat breath? It should stink, shouldn’t it? Actually no. It should smell a little, but any excessive odour may indicate dental disease. Dental disease in Dogs & Cats is caused by bacteria under the gum line causing infections. These infections cause lysis or breakdown of the tooth attachments making teeth loose and very painful. It can also predispose to abscess formation within the jaw. Bacteria can also circulate around the body seeding nasty infections in their liver, heart and kidneys making your pet very unwell. So keeping your pet’s teeth clean and avoiding “death breath” is crucial to maintaining their health and avoiding dog dental issues. It has also been scientifically proven that a healthy clean mouth prolongs life expectancy. Some pets are unfortunately born with more nasty / pathogenic bacteria in their mouths so, despite regular cleaning or dentals, bacteria may still proliferate causing disease. Other pets, especially dogs with “beards” can have long fur ‘wicking’ bacteria into their mouths seeding infections, making dog dental care critical. Our feline friends, even after cat dentals may also develop severely painful resorptive lesions on their teeth, that ultimately require extraction. Here are a few tips on how to keep your pet’s teeth clean between dentals. Royal Canin Dental or Hills T/D Dry food – these premium pet foods are a larger kibble size thus encouraging chewing. The interwoven cross fibres also aid cleaning. Ingredients are also added to help bind calcium and prevent plaque formation. These complete and balanced diets researched by vets and scientists ensure your pet is on the best nutrition with added dental benefits. Chew toys: Kongs – smear with peanut butter / vegemite / cream cheese; add chicken stock and place in freezer for a tasty summer chewy treat. Greenies or Dentastix once a day. Deer antlers are efficient but can be very hard, so watch for tooth fractures. Bones are controversial. As they may be very hard, the risk of tooth fractures increases. Tooth fractures are painful, seed infections deep in the tooth root and ultimately require extraction. A ‘safe’ bone is a ‘dinosaur’ bone – an intact cow femur with the big knuckles on the ends – think Sideshow Mel from the Simpsons and the bone worn in his hair. 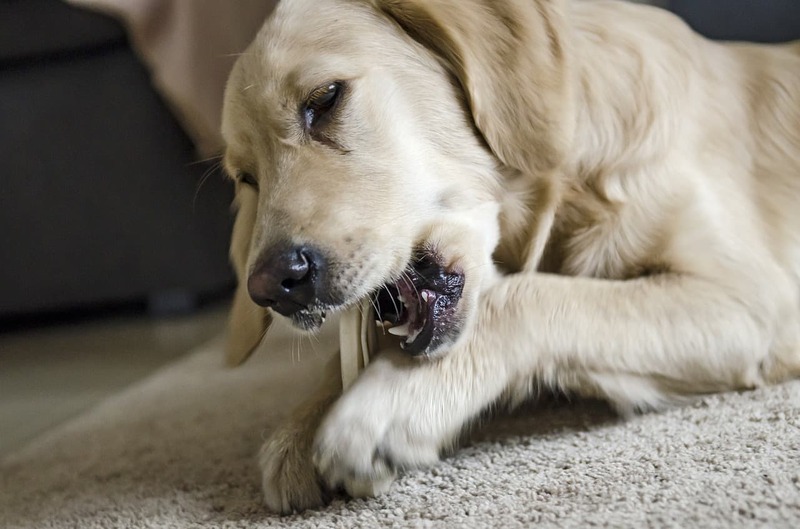 Allow your dog to chew until the cartilage ends are gone, then throw the remaining bone out. Raw hard bone can increase fracture risk. Also ensure the bone is intact, not split in half. This splitting can increase tooth fractures due to the cow bone anatomy meeting your dog’s teeth anatomy. Smaller dogs and cats may benefit from a whole, raw chicken neck once a day or every second day. Chicken wings are not recommended as the saturated fat in the skin may cause intestinal issues. Brushing may be done once a day with a pet-specific or child’s soft toothbrush using a pet-friendly toothpaste. Often meat or cheese flavoured, they are low in fluoride so when they swallow it, they won’t get toxicity. Ever asked your pet to spit? To read more about dog dental care, click here. If you have any questions, please feel free to call us or make an appointment for a free dental check.